Three tornadoes touched down in Connecticut yesterday, according to the National Weather Service. The NWS has just announced that a third tornado struck the state on Monday. The EF0-category tornado touched down in Enfield around 1:45 p.m. It had a wind speed of up to 65 mph and a width of 50 yards. The twister traveled about three-quarters of a mile, according to the NWS. Another EF0-category tornado touched down Monday morning in Fairfield County. According to the National Weather Service, the tornado began at 718 North Street in Greenwich and ended at Janes Lane in Stamford. The tornado reached wind speeds of up to 80 mph and had a maximum width of 150 yards. An EF1-category twister tore through the area of Windsor Locks and East Windsor between 1:30 and 1:45 p.m. Monday. According to the NWS, the tornado reached wind speeds of up to 86 mph, was up to 200 yards wide and traveled 2.5 miles. The EF1 tornado trees and power lines, scattering tobacco cloth, pulling the Sports World dome out of the ground and removing siding from houses. "It was less than a minute — just, boom, just a wall of air going by the window, trees going down left and right," said Dan Rozman, who watched the tornado before preparing to take cover. 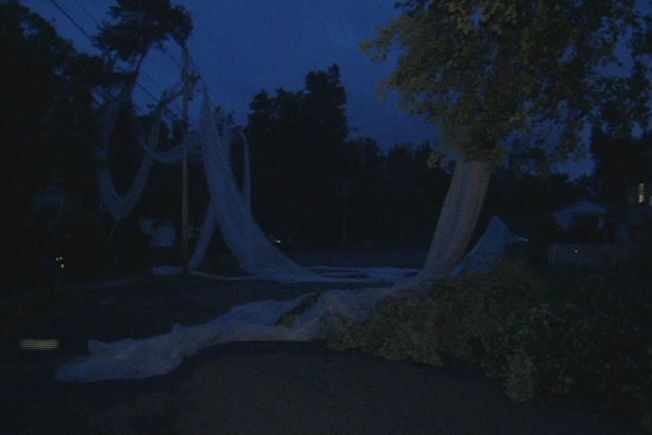 Damage was concentrated in the areas of East Windsor, Windsor Locks and Fairfield County. Multiple lanes of traffic on I-91 southbound were closed near exits 44 and 45 in East Windsor after debris from the Sports World dome on Main Street blew onto the highway, authorities said. One viewer said he was driving home from work when he saw the dome fly across the interstate. Camp was underway at Sports World with the tornado struck. Counselors received tornado warnings on their phones and moved the 29 campers to safety just moments before the storm hit and swept away the dome, eyewitnesses said. "Maybe two seconds after they got through the door, I looked back and heard a loud boom... and saw the top of the dome going flying into the air," said camp counselor Kyle Noonan. Also in East Windsor, a tractor-trailer rolled over in the Walmart parking lot on Prospect Hill Road. Police worked to free the driver, who was still inside when the truck toppled. A resident of Cricket Road said a tree in her yard had snapped and was dangling over her house, taking down power lines and narrowly missing her roof. In Windsor Locks, two transformers went down and multiple trees fell, according to First Selectman Steven Wawruck. Damaged tobacco cloth left a trail of debris throughout the area. "I have a tree that's around my boat right now," said Windsor Locks resident Peter Devine. "We have a screen house on the porch," said Elizabeth Bartley of Windsor Locks. "We saw it take off like the Wizard of Oz house blew away." The four-way intersection of Reed Avenue and Sadler Street flooded Monday afternoon, and the area of South Center Street was closed indefinitely due to heavy storm damage. Police and fire officials were standing guard to keep the area off limits. Electricity has been shut off in some sections until cleanup efforts are complete. Strong winds tore metal roofing off a vacant warehouse building on Hayden Station Road. The roofing was flung into a back parking lot and nearby woods. Connecticut Light & Power reported 2,414 outages statewide, 806 of which were concentrated in Windsor Locks. The utility company is asking people to stay away from tobacco cloth whipped around by the storms and draped across power lines, which can be very dangerous. Gov. Dannel Malloy and state emergency response officials were continuing to monitor the situation Monday afternoon. Malloy said he has spoken via telephone with Wawruck and East Windsor First Selectman Denise Menard to discuss resource coordination and recovery. Earlier on Monday, heavy storms prompted a tornado warning for lower into central Fairfield County. That storm flooded streets and downed power lines in Ridgefield, according to emergency officials. It swept through lower Connecticut from Greenwich to Redding, where CL&P reported scattered outages are affecting nearly 650 homes, including around 350 in Wilton. The National Weather Service is investigating the storm that hit southern Connecticut Monday morning to determine whether or not it, too, contained a tornado. No storm-related injuries have been reported. If you see severe weather, send your photos to photos@nbcconnecticut.com.